You are invited to visit my Albion history booth at the Festival of the Forks in front of Citizen’s Bank this coming Saturday morning and early afternoon, September 20. I’ll have my Albion history books available, and will be accepting donations of Albion & Calhoun County history books, atlases, city directories, photographs, etc. We’ll see you there! A reminder that my articles from this column are also placed on the www.albionmich.com web site. Be sure and visit it and see what’s there! As we celebrate our ethnic diversity in this city, we are reminded that each culture brought with them from the “old country” certain customs and practices. Some practices were also adapted and Americanized. Because of inheritance laws back in the “old county,” it was often prudent to take a photograph of a funeral in order to prove that a person was really deceased. This would help speed up any inheritance transfers of land and belongings left behind with other family members. A photograph would also show the various family members and mourners who attended the funeral. It became customary to prop the deceased up in his casket, and be surrounded by the family and friends when the photograph was taken. Such was the case at the local Holy Ascension Orthodox Church on Austin Avenue. This church was organized in 1916 to serve the spiritual needs of the hundreds of persons who came to Albion from Eastern Europe, whose fathers were recruited to work at the Albion Malleable Iron Company. One such person was Alex Dmitruk (1887-1923). He was a native of the Galacia region of the Austrian Empire. He was married to Anna Egnatuk (1890-1969), whose mother Helen (Bleshinski) Egnatuk (1850-1946) was the matriarch of the Russian Community. Helen was employed by the Albion Malleable Company to serve as the liaison with the local Russian settlement and run the company housing. Alex worked at the Malleable and lived with his wife in company housing north of the plant at 24 Factory Place, now the site of McAuliffe Park. The Egnatuk family lived at 2 Factory Place, and later moved to 718 Austin Avenue. Alex was a founding member of the church and served on the first Parish Council. He and his wife Anna purchased a small meat market on the “West End” which they ran. They subsequently purchased a farm between Springport and Eaton Rapids where they lived, along M-99 just north of the junction with M-50 Unfortunately, Alex died there on the farm (“too much alcohol,” as a family history states) and was buried in Riverside Cemetery. His widow was left with several girls and one baby boy to support. Due to space limitations, we’ll end the family history story at this point. This week from our Historical Notebook we present an unusual photograph of a common practice in the early 20th century. 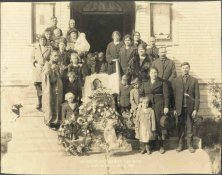 It features the funeral party of Alex Dmitruk on October 5, 1923, posing on the front steps of the Holy Ascension Orthodox Church. In the center of course in the casket is Alex Dmitruk. On the left above, the woman holding the baby is his widow Anna (Egnatuk) Dmitruk (1890-1969) who later married John Marchuk. She is holding their infant Leo Dmitruk (b. 1922). Above her is Helen (Bleshinski) Egnatuk (1850-1946), the matriarch of the Russian community here. To the left of Helen by the window is her son Walter Egnatuk (1893-1952). Below is his brother Egnat Egnatuk (1895-1977) with his infant son Alex (1921-2001) to the right, and wife Anna (Slivoskey) Egnatuk (1904-1958) on the left. Below is the priest, Rev. J. Velma, followed on the right by the four Dmitruk girls in descending order top to bottom: Helen (1911-2002), Nadine; Alice; and Anita known as “Bobbie” who lives in Kentwood today. On the right half of the photograph beginning at the top above the casket, the child is unidentified. The first woman is Sophia Dubowik (1887-1944), wife of Grigori/George Dubowik. The second woman is “Tetcha” Egnatuk (1900-1981), the first wife of Walter. The third woman is unidentified. The woman in the fur coat below her is Mrs. Mary Olinyk (1897-1963). Below her are her two sons, Peter (1917-1980) with his head turned, then Walter who lives in Marshall today. The man to the upper right of Mary is unidentified. Next to Mary on the right is Jacob Thurovat (1877-1951). Below him is his wife Anna (1895-1962), and below her is their daughter Lydia (1920-2002). Standing on the far right is Paul Olinyk (1889-1953). Special thanks to those who helped with identifications for his week’s photograph, and to my 2nd cousin Phillip W. Collier (a direct Egnatuk/Dmitruk descendant) for supplying it.